The Pacers couldn’t have asked for a much better showing from their five-rostered players in their first Summer League game as they combined for 75 points in the blowout win over the Orlando Blue, 93-66. Keep reading for a look at each of those player’s performances and some highlights. Young was the leading scorer of the Orlando Summer League last year, and he looks like he wants that title again. Young struggled to get it going in the first couple minutes of the game, but settled after the first timeout. He was on fire in the second quarter, making three straight 3-pointers. The concerning area on offense were the turnovers. The Pacers know the Young can score and are looking to see him run an offense, set up others, and limit those turnovers (hopefully this common problem was just a lack of playing together and it will improve for all throughout the week). On the defensive end, nothing stuck out in first viewing particularly negative or positive, but no one on the Blue’s roster represented much of a challenge in the backcourt. He also had an impressive posterization with the left hand and fortunately bounced back up and was fine after this scary fall. 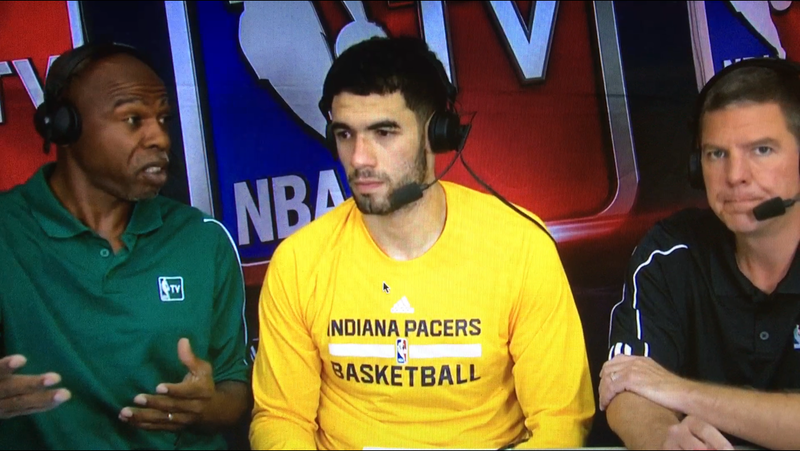 Niang, the Pacers rookie second-round pick, showed off his entire arsenal of offensive skills. His first basket was a nice jump hook in the post, then he made a crafty finish in the lane, then nailed a three off of a pick-and-pop play. In addition to his inside and outside scoring game, Niang, who was a team high +24, showed off his basketball IQ with quick ball movement and setting up other players. One of Niang’s assists came off a tremendous hustle play where he dove to save the ball from going out of bounds and got it right to a wide-open Young for a 3-pointer. Another one was a perfectly placed alley-oop pass to Rakeem Christmas. The 4 turnovers keep his debut from being an A+. He didn’t seem overwhelmed on the defensive end and even drew a charge on Magic rookie Stephen Zimmerman at one point. This wasn’t a team full of NBA prospects, so it’ll be good to watch Niang guard against a more talented group. Multiple people during and after the game compared Niang’s game to Draymond Green’s on the offensive end and you can see flashes of that. Young had plenty of praise for his teammate as well. Joe Young on Georges Niang: He can bring the ball up the court, he can rebound, set screens. He’s a great player. It’s a good pickup for us. Robinson had two huge dunks and played with great confidence on the offensive end. While Robinson wasn’t as sizzling from the field as Young or Niang, he still hit a respectable 46% overall and 40% from deep. He set up one of his highlight slams with one of his three steals. Robinson’s trying to make his case for rotation minutes this season and a good showing in the Summer League will be a good start to earn trust from new coach Nate McMillan. New assistant coach Bill Bayno was apparently loving the slams from GR3. Bill Bayno is smiling so much after those highlights from Glenn Robinson III. The best thing to see from Christmas was a smooth jump shot that ranged pretty close to the 3-point line. Christmas made a few midrange jump shots that the broadcasters were impressed to see him hit. He was efficient with his limited shot attempts. Christmas tried to do a little too much a few times that led to his 4 turnovers (a common problem for the Pacers). Once, he lost the ball on a spin move, and on another he threw a far-too-fast pass to a cutting Niang. He got beat a few times early by Zimmerman, but played okay on that end. Whittington came off the bench and split time at the center position with Christmas. He also struggled early against Zimmerman, who easily blocked one of his early shots. Whittington flashed his ability to stretch the floor by hitting his only attempt from 3-point range. You’d like to see Whittington grab more than only one rebound, but it wasn’t an issue for the Pacers as a team overall. Whittington did the best job of the five in taking care of the basketball as he only turned it over once. Nate Wolters quietly had a nice game with 9 points, 7 rebounds, and 4 assists, but also struggled with turnovers (4). Scotty Hopson added 6 points, and Dyshawn Pierre hit a 3-pointer. Game 2 is tomorrow at 1 p.m. The Pacers play the Charlotte Hornets. Full schedule here. Good start for the good guys. Can’t wait to see what the 2nd year players do against better lineups. Super excited for Young, Christmas, and Robinson.